The States ain’t all about junk food, coffee and down home cookin’, contrary to much popular opinion. Yes, it is the home of the hamburger, and awash with salt-laden processed food and fast food joints. But, just like here, you can get good food, really good food, in the US. Having been charged with cooking the Christmas dinner, we went hunting for some of that fine food. And I had heard rumours that one of them had an in-house butcher. Sure enough, we found an unmarked door with a button alongside saying “Press me” (or words to that effect). It was all very Alice-in-Wonderlandish, which for Georgia is downright weird. Nevertheless, I pressed and waited. And sure enough a big (and I mean BIG) butcher appeared, his white butcher’s hat brushing the ceiling. We had a discussion over what cut was good and how long it should be cooked. And then he disappeared back through his door, only to reappear moments later with a four rib roast. So, Christmas dinner Georgia style was a standing rib roast, cooked medium rare, tender as you like and full of flavour. Six and a half pounds in weight (about 3kg), it went into the oven at 425oF for 20 minutes and then another 1hr 40mins at 300oF. Thirty minutes rest and served perfectly pink with roast spuddies and onion gravy. Yum. And it’s not just produce. If you look carefully you can find fine food in the most unlikely locations. Foe instance, about six miles out of town, along a dusty red road you come to a pair of ornate gates consisting of a leaping metal fish bursting out of thick wire reeds. It’s incongruously modern and really quite lovely. This is Flat Creek Lodge, a huntin’, shootin’, fishin’, eatin’ kinda place. The decor is definitely (and defiantly) rustic American, like a taxidermist’s take on Twin Peaks. All deer-hoof coat hooks, stuffed alligators eating stuffed fish and warm pine paneling hung with rattlesnake skins. So far so (to English eyes) strange. The food though, is both sophisticated and tasty. Provenance is taken very seriously and they farm their own fish, raise their own game and nabbed themselves a very good chef. There was no choice, just a set lunch menu. That day it was quail with grits. 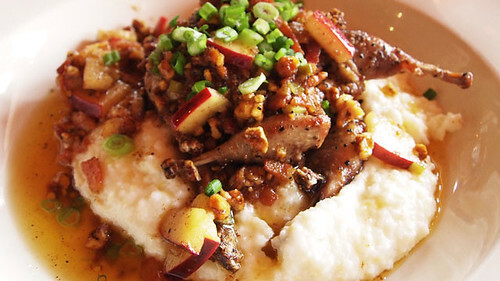 But, to paraphrase a well worn, cliched advert, these weren’t just any grits… The dish consisted of very plump (locally raised) quail, cooked to tender perfection sitting atop a pile of smooth creamy grits slathered in apple, pecan and bacon infused butter. My arteries were screaming in protest, my belly in delight. Finishing off with blueberry cobbler (and yes, the blueberries were grown onsite too), which came big enough for two, this whole meal came to $20 and would not have been out of place in a fine dining Mayfair restaurant. Bargain. What struck me again, as with the budget food, is that Americans (the ones I met anyhow) take their food seriously. There is an expectation of something tasty, even if it is often too salty, too fatty and too damn big for me. Sounds (and looks) gorgeous! I’ve still not had grits…. going to have to rectify that one day. @Su-Lin – it was, a real surprise to find in the middle of nowhere in a dirt poor part of the states. As for grits, if you are ever in Atlanta, I can recommend those at The Flying Biscuit – not as good as these, but not bad at all. Or if Elizabeth’s in Savannah do them and you;re ever there, snap ‘em up. sounds like you had a wonderful Xmas dinner at home. as for the other place- a ha, a farm-to-table resto, how lovely. (and delicious). @Shayma – it was a corker, I’ve always wanted to do beef for Xmas, this year I got my wish. And that resto – it was fab. The food was as fresh as you like, and you could really tell.